While we were in Italy one of the artists in our group, Lety Herrera, from Mexico, asked if I had ever tried Watercolor Canvas. I hadn’t, and she suggested I should, so when I arrived home I picked up a pad of small sheets. I was amazed how good it was to work on and how well the washes reacted to the primed surface. I did a couple of small paintings then ordered a roll of the canvas. It needs to be stretched or mounted securely to a board before you paint on it or it will buckle and twist badly, making it impossible to work on. The paint tends to sit more on the surface than it does on paper, and can easily be washed back to clean canvas. This may sound like a problem, but you soon get use to gently working over underlying washes so as not to disturb them. Eventually, the ability to easily lift off pigment becomes an advantage, allowing tones to be adjusted and whites to be retrieved at any stage. You may wonder why work on watercolor canvas when there are so many excellent watercolor papers. For me, the big advantage is not having to place the finished painting under glass plus the option to work on a larger surface. Once finished the paintings need to be treated with a suitable varnish. I still love the feeling of painting on watercolor paper but this watercolor canvas offers a new way of working and different way to present your work. 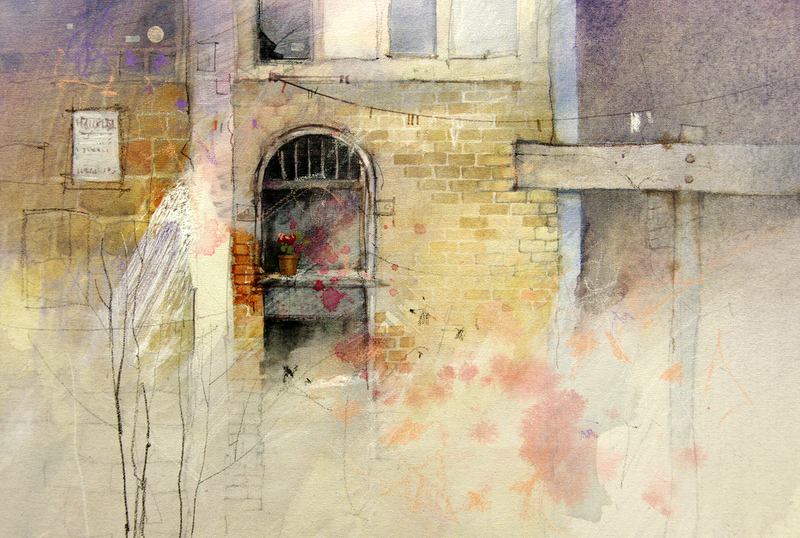 I see it as an extension to the traditional format of watercolor on paper. Acrylic, ink and pastel can also be incorporated into these paintings. Fredrix Watercolor canvas is acid free, 100% cotton canvas, primed with a patent pending, specially formulated Gesso for all water based paints. It is available in pads, boards and in a 58″x 3 yard roll. This entry was posted in acrylic painting, Art Materials, Italy, Mixed Media, Painting Demonstrations, Sicily, Sorrento, Watercolor and tagged Art Materials, Mixed Media, painting materials, Watercolor, Watercolor Canvas, watercolor painting by splashingpaint. Bookmark the permalink. Would you ever consider running a workshop somewhere in Germany? Thanks for your comments. I haven’t tried the Golden absorbent ground – sounds fantastic. I picked up a bottle of Schmincke Aqua Primer recently. It sounds like the same thing – I haven’t had a chance to use it yet, but am looking forward to trying it out. I’d like to do a workshop in Germany one day. Not sure when though, 2011 and 2012 are pretty well full up already! Golden’s Absorbent ground that Cynnie mentions is very good, I found it quite hard to get and ended up at Jacksons Art in London, where you can order on line. it doesn’t have any of that plastic feel of ordinary gessos. However gesso made by Lefranc and Bourgeois is also good. Or you could make it yourself…. I was introduced to the WC canvas from following Tom Lynch. I tried it and it was a unique experience. I found that you want to lay down your colors at the value you want the first time otherwise you will be mixing additional colors into your first layer, but the good part is you learn to be more deliberate when you paint . I have several nice pieces that look great w/o glass. Thanks for you comments. 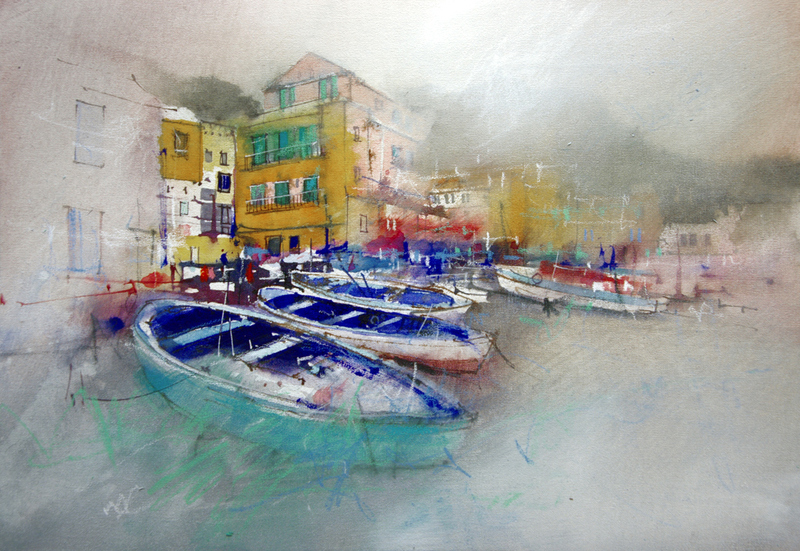 The watercolor canvas does make you work in a different way to painting on paper. I find the edges are always a bit harder and putting one layer over another and softening the edge without disturbing what is underneath is a tricky operation. I think paper is easier to work on but I really like the look of the paintings on fine canvas with a smooth matte glaze over them. Very interesting format that Lety Herrera gave you John. It is a dfferent paper addition to water colour painting. Did you ever receive the DVD I sent you, perhaps it got lost in the mail. We received the DVD last week and watched it over the weekend – Fantastic! you did an amazing job – I cant believe you managed to gather so much information. Dianne and I thoroughly enjoyed it and we really appreciate you sending it out to us. Dianne is going to send you an email later in the week. What is the difference between the watercolor canvas and painting watercolor on to gessoed canvas? It sounds like the properties are the same. Why would painting on this make it unnecessary to frame under glass. It’s still watercolor after all. Why can you varnish this and not a watercolor done on paper? Have you tried the watercolor board from Ampersand? If so, how does the canvas compare to that, working wise? Normal acrylic gesso primer behaves a bit like plastic when you paint watercolor on it. This stuff is is more like paper – more absorbent and the paint doesn’t bead. Once sprayed with a polymer varnish, the finished product is pretty robust. I have done large paintings on paper and coated them with a bees wax varnish. It makes them impervious to moisture (you can wash them down!) but the paper can still be scratched or damaged if treated roughly. The watercolor canvas is much tougher. I also like the fine texture of the canvas. I haven’t tried the Ampersand board, but will watch out for it. Firstly love your work and especially the above done on this watercolour canvas!! Great info. from yourself and contributors. I just love the feedback thats shared-exactly what I have been searching for on the internet. Have been enjoying using inks on canvas lately and will definitely be buying some of this w/c canvas to use with my w/cs & inks. Just a quick question in respect to varnishing the w/cs on this canvas. I have been using an acrylic spray on the inks on canvas but they are acrylic base & solid when dry. Is there a special varnish/brand that you have found or could recommend for this w/c canvas??? Thanks Jackie – mallee vic. Thanks for your comments. I use an acrylic polymer satin varnish as a final varnish over the canvas. It is best to spray it on. If you don’t have access to a compressor and spray gun, you can pick them up for around $150 at super cheap auto. They are not good quality, but for the small amount of use varnishing paintings, they will last a few years. There is a huge difference in finish between brushing and spraying. I have tried gloss and mat acrylic varnishes too. Gloss is great on surfaces with no physical texture, but the satin works well on anything. I can’t tell any difference between the brands. At the moment I am using Atelier, but I also have Liquitex, W&N and Jo Sonja – they all seem to do the same job. While I am working I sometimes use a spray can of mat varnish or workable fixative to preserve charcoal or pastel lines during the course of a painting. I love being able to work big with watercolor and mixed media and not have to bother with glass. A friend just directed me here. Thanks for your comments and glad you like the paintings. I have used Yupo, but it doesn’t suit the way I paint (mixing different media and building things up in layers). Yupo feels a bit like painting on plastic – everything sits precariously on the surface. I have seen some fantastic work done on yupo paper and really admire the way some people have adapted techniques to take advantage of it. The watercolor canvas and watercolor gesso sit somewhere between Yupo and regular watercolor paper. Remarably helpful! Both The comments from John and from the comments. Thank you to EVERYONE. For a newbie this is all so helpful. I know watercolor has lost favour in the gallery world due to the glass so this is a perfect way to go for a professinal like yourself. Over the past couple of years I have been checking out your website, I have learnt alot from it. I love reading your blog, and looking at the latest paintings which are great. I was in PNG for 3 years which proved to be a brilliant place to start painting with water colour and I had a very inspiring teacher too – lucky me. I was inspired to buy some water colour canvas after reading your post in your blog and have ordered some – hurry up postman please I can hardly wait! This is just a note to say thanks for all the great advice and for sharing your brilliant work. Hope the postman has arrived with your canvas. I love how the landscapes fades towards the end. It’s very subtle and beautifully done. Did you ever discover a ‘suitable varnish’ for your watercolor paintings on canvas? I use a satin acrylic varnish and apply it with a spray gun. There is also a gloss varnish available but I prefer the satin finish. The brand I use is Liquitex. is the “watercolor canvas” different with ordinary canvas that are sold on usual art supplier? and if they are different, what is the different? i’m a newbie in watercolor painting..thanks for reply.. The watercolor canvas is primed with a special gesso that absorbs watercolor paint similar to paper. The normal canvas sold for oil and acrylic painting can be primed over with a few coats of watercolor gesso and will then accept watercolor. Normal gesso does not have the same absorbency as watercolor gesso. I’ve just painted on my first water color canvas. I googled how to “fix” the watercolor to the canvas and found this thread, — which is very informative. I purchased Lascaux acrylic fixative in the aresol can. What are your thoughts on this over brushing on an acrylic varnish? Also, have you noticed any yellowing or discoloration due to varnishes? I haven’t tried the Lascaux fixative. I usually give a very light spray of fixative if I have pastel or charcoal on the work. This is followed by an acrylic varnish after the fixative has dried thoroughly. I have had no problems with the varnish yellowing. When it is applied it has a milky appearance which clears as the varnish dries.